I finally own a suitcase and large, carry-on bag that I am happy with, but I still couldn’t find a day bag that I liked for traveling. My laptop backpack was too big and a purse either didn’t hold enough or hurt my shoulder when it did hold everything I wanted. I felt like Goldilocks, nothing was just right. A bag big enough to carry a large water bottle, a light jacket, money and credit cards, cell phone, and a toiletry bag with essentials (like band- aids, contact drops, and wet wipes). It also had to fit my large Nikon DSLR camera. I wanted it to carry all of this without leaving a permanent indentation on my shoulder. I was looking for this magical “not a purse nor a backpack” bag for about a year and nothing was it. Until I kept noticing people with this sling bag. I saw them hiking but also shopping around town. I saw them at music festivals and at playgrounds. Then I saw the bag at my local hiking store and tried it out. A few times. And then I tried out its nearest competitors. 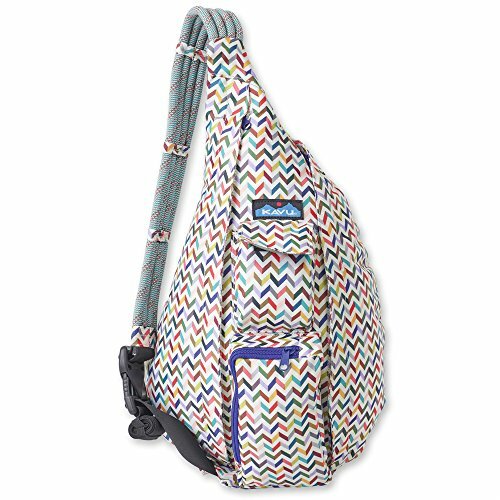 And like Goldilocks, I believe I have finally found my “just right” in the Kavu rope sling bag. Comfortable Straps. It’s a one- shoulder sling bag, but the straps are wide so they distribute weight well. And it works over left or right shoulder so I can switch shoulders when I really have it weighed down. The strap is easy to adjust which is nice when I bike ride and like to wear the bag a little tighter. Zippered Pockets. There are 2 main zippered pockets that each hold about half of the bag's 660 cubic inch capacity. Combined, they hold a water bottle, ipad, DSLR camera, a few bars, and a light jacket. There are also 2 small exterior pockets- one with a zipper that’s a perfect size for a cell phone and a slightly smaller pocket with a velcro closure that’s good for chapstick, tissues, sunscreen, etc. Durable. It is sturdy enough to hold a bottle of wine or a quart of milk if walking home from the corner store. (Done both of those several times now.) So far, my bag has been very durable and stain resistant which I worried a little about with the canvas fabric. I have set it down on many a dubious park bench and restaurant floor and come away okay. Perfect Size. It is still small enough to still pass as a purse (especially if I don’t stuff it full) which is helpful at places that do not allow backpacks. Some of the things I usually stuff in my Kavu. The choices of patterns are all pretty loud. I wanted a bag that could carry over to dinner in a decently nice restaurant if needed. They do offer a basic black option but the canvas material seems to attract lint. At least the black bag I saw did. I ended up with a deep gray, abstract pattern over a tan background and I have been happy with it. It’s popular around college students and extremely popular around elementary and middle schools. I was concerned about being too trendy (especially sharing a bag with the Justin Bieber set) and whether the bag was really worth $50. But now that I have one, I can say that I think its popularity is because it is so useful. As far as being the must have, pre-teen fashion accessory , I can vouch for that being based (at least a little bit) on usefulness as well. Both of my nieces have a Kavu that they just took to Europe and loved. It is big enough for their tablet (but not a laptop), water bottle, phone, snacks, and other carry- on essentials like books, crayons and paper. They even managed to get a change of clothes in there. So it works great for kids as well as adults. So there you have it, my Ode to the Kavu and the reasons why I love it. I have had mine for about 6 months now and find myself using it more and more, not just for travel, but as my primary bag at home too. If you have been looking for a great day bag like I was, go try one out at your local outdoor store. Or, you can always order one off Amazon (like everything else on the planet). My nieces and Amy’s daughters in Paris. A little Kavu collective. This itinerary gives you all the information you need for your summer road trip along the southern coast of Iceland. The best stops and sights to visit are detailed along with dining and lodging options at your stops near Vik, Hof, and Reykjavik--all with travel tips learned along way. Too busy to read through a million blogs and guidebooks? Simplify your life with this 7-day itinerary. Everything you need to know: where to sleep, eat, and play! All organized into day-by-day plans. Currently available on Amazon Kindle Unlimited and paperback.